Melbourne's own electro/pop five-piece project, The Engagement has already released a collection of well-received singles without any sign of letting up. Melbourne’s Fox FM described the project as “a cool 80’s/retro sound”, while Triple M personality Jane Gazzo simply called it “Fantastic”. 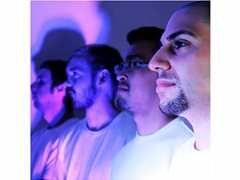 Drawing influences from artists, such as Imagine Dragons and Coldplay, The Engagement combines catchy melodies and edgy production with lyrical depth that creates a unique and addictive sound. With previous singles, "Let Go" and "Unbroken" generating over 500,000 streams globally and reaching the US No.1 indie radio top spot with their single "Home." The boys have successfully completed a residency at Melbourne’s Grace Darling Hotel, 12-Date Regional Tour and currently working on new material due for release late April this year. The Engagement is quickly gaining fans in Australia and around the world. We are looking for a committed electric/acoustic guitarist to join our project. Rehearsals usually run on Friday nights or Saturday Afternoons. Expenses : You will be paid if we receive payment from shows.